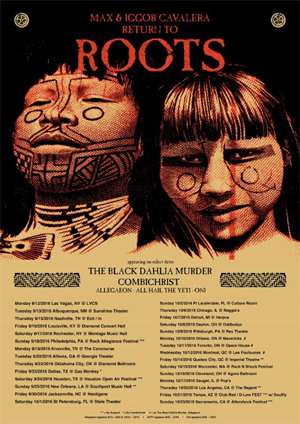 Announcing the Max & Iggor Cavalera RETURN TO ROOTS tour - celebrating the 20th anniversary of the legendary album Roots - to be played in its entirety each night! The North American tour, which kicks off in Las Vegas on September 12, will feature direct support on select dates from THE BLACK DAHLIA MURDER and COMBICHRIST, with additional support from ALLEGAEON, ALL HAIL THE YETI and ONI. Max & Iggor Cavalera will perform their set with their CAVALERA CONSPIRACY brothers, guitarist Marc Rizzo and bassist Johny Chow. In addition, very special Meet & Greet passes can be purchased at Max & Iggor CavaleraRoots CD, cassette or vinyl. This applies to only the Roots album and one autograph and one photo will be permitted per person. Don't miss this unique opportunity to have your Roots album signed by the men behind the music. "Metalheads! It's time," declares Max Cavalera. "20 years ago, we released the Roots album and changed the face of metal forever. Now, we're returning to "the roots" to show everybody the magic and inspiration of the Roots live experience! You cannot miss this RETURN TO ROOTS 2016!" Iggor Cavalera adds, "I am very proud to play Roots again, to reaffirm that after 20 years, it still moves people! We hit the stage again with Roots to destroy everywhere we pass by!" Max & Iggor Cavalera are the original founding members of influential RIAA Gold-Certified Brazilian heavy metal legends SEPULTURA, and specifically the team behind the band's early albums, including seminal releases Arise, Chaos A.D. and Roots. Since the band's formation over 30 years ago, the Cavalera brothers have each seen unparalleled successes in the music industry. Max's more recent work with SOULFLY, CAVALERA CONSPIRACY (also featuring Iggor) and KILLER BE KILLED, in addition to Iggor's project MIXHELL, proves the lasting power of the Cavalera legacy.